Color Choice : complete brown family. An eternal classic from our range this B5 size double fold with lock. Effective both as a folder as well as underarm portfolio with genuine leather conference folder in a rich tan color will make a great gift item for your next event be it a conference or corporate meet or any other special event which needs a special gift. 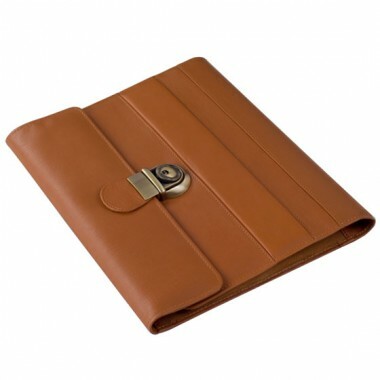 A unique combination of fine grain print and smooth leather on the outside adds the rich elegance of this folder. The brass antique finish lock compliments the theme. An equally befitting inside design will be big hit with the users. A neatly arranged portfolio on the left comprises of 2 zippered pockets of great utility, 2 large pockets for papers and pads, credit card slots complete the thoughtfull design. ID window and or calculator pocket and a pen loop can be added on request. 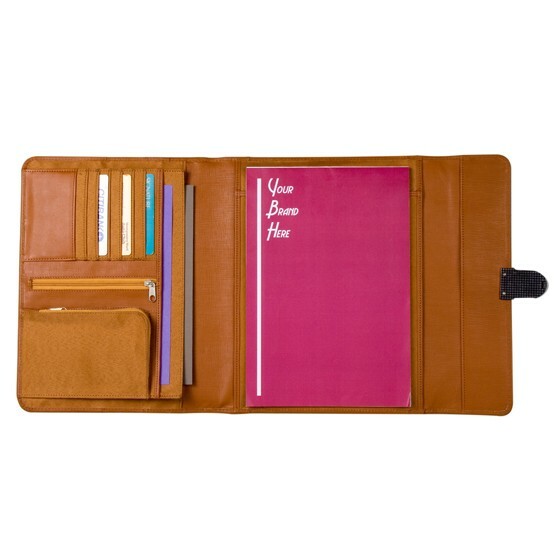 The writing pad slot take side bound or top bound pads or wire bound note books. This Style SQ036B5 can be scaled to other sizes like A4, A5 etc and customized for your specific requirements.